I was entertained and learned a few things. I don't read a lot of non-fiction books but for some reason as soon as I saw this book I knew I wanted to read it. I love learning about anything medical or science related so it was as surprising of a choice as you might think. I have always said that I read a little bit of everything and this book is proof positive of that fact. 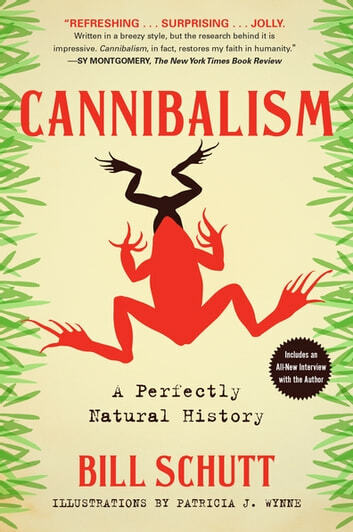 Cannibalism is a really interesting subject and I learned a lot while listening to this book. It was really an enjoyable experience. I have to admit that as soon as I saw this book, I started thinking about criminals who practice cannibalism. If you are looking for a book that chronicles the actions of serial killers, this probably isn't the book for you. There is a little bit of those kind of stories in this book but very few. The author actually makes a point to explain why he chose not to focus on criminals. This book instead deals with many other topics pertaining to cannibalism. If you are interested in learning about cannibalism in nature, look no further because this book is full of that kind of information. This books covers cannibalism in fish, birds, tadpoles, insects, and spiders. It discusses why it might be advantageous for animals to cannibalize others creatures of their own species sometimes including their own offspring. I can honestly say that I learned more about cannibalism in nature than I even knew that I wanted to know. I really enjoyed the sections of the book that involved human cannibalism. The very few sections that did discuss criminal cannibalism were very interesting. At the very beginning of the book, I learned that the book Psycho is based off a true story of a man that killed and cannibalized his victims. Survival cannibalism was another very interesting topic. I had never heard of the Donner party prior to listening to this book but I was captivated and saddened by their story. There is a section that discusses the eating of one's placenta, not something that I ever gave any thought to before this book but interesting nonetheless. I thought that Tom Perkins was the perfect narrator for this book. It almost felt as if I were listening to a nature show on television. His voice is exactly the kind of voice I think of when imagining the voice over sections in any nature program. This book had a lot of details and was full of information but I never tired of listening to it largely because of the narrator's skill. I would recommend this book to anyone interested in the topic. It is a heavy subject but it is delivered in a very readable manner. There are a lot of details but it is presented in an entertaining manner. I was entertained and learned a few things. This is the first book by Bill Shutt that I have read but I would consider his work in the furture. I received a review copy of this book from HighBridge Audio via Audiobook Jukebox.